Be the first to share your favorite memory, photo or story of Darrell . This memorial page is dedicated for family, friends and future generations to celebrate the life of their loved one. Darrell Lafe Castor, age 82, of Verona, Missouri, passed away at 3:40 a.m. on Saturday, October 6, 2018, at his home. He was born August 30, 1936, in Aurora, Missouri, the son of Lafe and Lucille (Carr) Castor. Darrell was a 1954 graduate of Monett High School in Monett, Missouri. In his early work career he followed pipe line construction and later was employed by Friend Tire, where he managed stores in Nevada, Missouri and Harlingen, Texas. In 1979, he opened up his own tire and auto business in Rogers, Arkansas. In 1992 Darrell sold the business and retired moving to the Verona area. He soon discovered retirement wasn’t for him so he established a brake business and covered the southern Missouri and northern Arkansas area until he was diagnosed with Parkinson’s in 2014. Darrell was a member and attended First Baptist Church in Aurora, where he taught an adult Sunday school class as well as serving as a deacon for several years. Darrell was also a member of the Gideon’s International for over 30 years. He served on the local level and was the Missouri State President for three years. This ministry was very near and dear to his heart. He loved placing God’s Words in hotels, motels and especially to children in schools. He also loved speaking in churches explaining the Gideon ministry and sharing testimonies of how someone came to know the Lord from a Gideon placed bible. Darrell had the privilege of going on two Extension Action trips to place bibles. In 1994 he went to Porto Allergre, Brazil and in 1999 to Ghana, Cape Coast, Africa. These opportunities changed his life forever. For most of his life, one of Darrell’s favorite hobbies was raising, training and showing Quarter Horses. 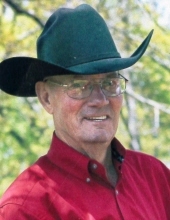 In 1976 he was a 4-H Horsemanship Leader in Nevada, Missouri where he organized a youth drill team on horseback. During this time the group performed at the Kansas City American Royal and various other locations. Darrell was an avid quail and pheasant hunter as well. On July 6, 1957, he married Donna Lauderdale in Purdy, Missouri. They shared 61 years of memories as husband and wife together and were blessed with three children. Darrell is survived by his wife Donna; one daughter, Shelly LaRue of Springfield, Missouri; one son, Delayne Castor and his wife, Lisa, of Verona; five grandchildren, Lindsey Garner and her husband, Eli, Colter LaRue and his wife, Amanda and Austin LaRue, all of Republic, Missouri, Chase Castor and his wife, Kelly, of Kansas City, Missouri and Chad Castor and his wife, Megan, of Rogers, Arkansas and six great-grandchildren…all were the love of Papa’s life. Darrell was preceded in death by his parents, Lafe and Lucille, an infant son, Travis, brother, Dan Castor and sister, Doris Schad. A funeral service, under the direction of the Crafton-Cantrell Funeral Home in Aurora, will be held at 11:00 a.m. on Tuesday, October 9, 2018 at the First Baptist Church in Aurora. Burial will follow at the Maple Park Cemetery in Aurora. Visitation will be held from 9:00-11:00 a.m. on Tuesday at the church. In lieu of flowers, the family request memorial donations be made payable to the Gideon’s or the Oxford Hospice, in care of the funeral home. To send flowers or a remembrance gift to the family of Darrell Lafe Castor, please visit our Tribute Store. "Email Address" would like to share the life celebration of Darrell Lafe Castor. Click on the "link" to go to share a favorite memory or leave a condolence message for the family.